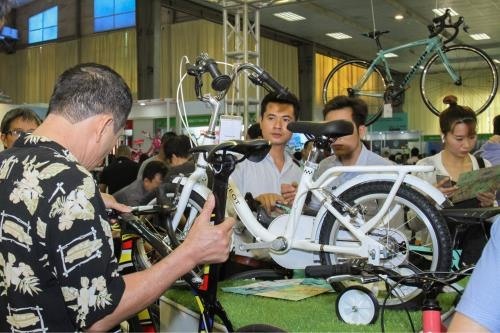 HÀ NỘI — The International Việt Nam Sport Show 2018 will take place in Hà Nội from November 15-18, attracting nearly 120 domestic and foreign exhibitors. The organiser Việt Nam National Trade Fair and Advertising Company said equipment for professional and individual sports, multi-functional gym systems, swimming pools, franchises of sport centres, vitamin supplements for sport players, health index gauging tools, and sport fashion will be displayed on a site of over 3,000 square metres. Major brands in professional sport equipment and infrastructure such as Sodex Toseco, Mizuno, Động Lực, Delta, and sport fashion brands such as Anta, 361 Sport, Alzado, Attivo and Bigfun will attend the event. The show will offer promotions and seek partners in building sport centres, franchises or distribution. In a study, ‘sports’ ranked second in media discussions with 18 per cent of the total, behind ‘music’ (20 per cent) and above ‘movies’ (17 per cent).